Christian Gather and Holger Barske designed the Nexus, a loudspeaker equipped with high grad components. For bass a Nextel coated Seas Excel driver is employed. Nextel is a high tech synthetic material, especially for coating. Otherwise, the Excel W18 NX001 is similar to the W18 EX series with magnesium coating. For high frequencies a Seas Excel T29 CF001 with textile dome is used. Both drivers are connected to a 12 dB crossover. "Just take your favourite recording, sit down and listen. The Nexus will behave normally until you hear the kindling detail that you never noticed before. Then you will appreciate this speaker as much as I do. 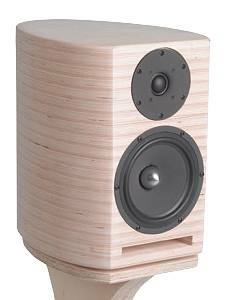 It's an extremely talented, non-capricious compact speaker of the highest standard."